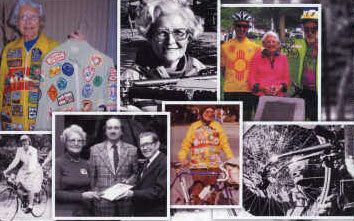 Club founder, Phyllis Harmon, was one of four honorees inducted into the Bicycling Hall of Fame at its new home in Davis, California in recognition of her lifetime of contributions to the bicycling movement. 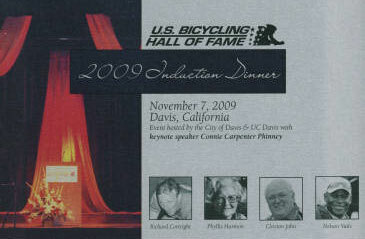 The event was hosted by the City of Davis and UC Davis with keynote speaker Connie Carpenter Phinney. Phyllis Harmon has made a tremendous contribution to the sport of cycling by resurrecting the League of American Wheelmen, the oldest bicycling organization in the United States. Since buying her first bike for $28, a 12-year-old Chicago girl then known as Phyllis Wiedman, has spent her entire life promoting bicycling. As a teenager, she wasn't afraid to bike 30 or 40 miles to visit a friend or relative. In 1937 at age 19 Phyllis was a member of the Evanston Bicycle Touring Club which received the first League of American Wheelmen club charter. The League's Chicago Council began publication of the Wheelmen Bulletin and Harmon volunteered to publish the bulletin beginning in 1929. Thus began a long history of volunteer efforts on behalf of cycling. Bicycle clubs and their memberships were growing and by 1940, the League had become a national organization with the mission of promoting general interest in cycling. Interest waned in the postwar years but with enthusiasm and her knowledge of bicycling, Phyllis helped resurrect and bring the League back to national prominence by 1966. During her years with the organization she has acted as the treasurer, executive vice president, historian, office manager, and writer, editor and publisher of the "L.A.W. Bulletin" (now known as the "League of American Bicyclists" magazine) until 1979. Along the way Phyllis raised six bicycle-riding children and met her two husbands through bicycling. Harmon also formed the Wheeling Wheelmen in 1970 and served on the Illinois Bicycle & Pedestrian Safety Advisory Committee. She has ridden thousands of miles across the United States as well as leading tours in New Zealand and the American West. 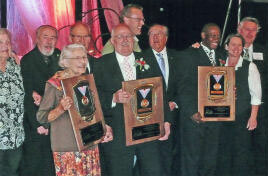 Harmon received the coveted Paul Dudley White Award in 1929 named after a former presidential advisor on fitness, and has since had the League's volunteer Award named in her honor. Up until 1972, Phyllis' efforts on behalf of the League was as a volunteer. The League of American Bicyclists, as it is now known, has over 300,000 members and is the leading advocacy group for cyclists.